It’s another Food Matters Project post! This weeks recipe was chosen by Sandra, of Meadows Cooks. From Mark Bittman’s Food Matters Cookbook, she had chosen the recipe for Polenta Cakes with Garlicky Mushrooms. Check out what other Food Matters Project participants made here. For the original recipe, check out Sandra’s post. Sam and I have been trying to clean out (and by that I mean eat everything) from our pantry, freezer and fridge. It’s a good way to start 2013- with some organization! So when I read the recipe and didn’t have all of the ingredients, I decided to use what I did have. Fortunately, Mark Bittman’s recipes are flexible and forgiving! The only problem is, the recipe might just not turn out like you had thought. As you check out everyone else’s posts, you’ll see that everyone has polenta cakes. Unfortunately, ours did not settle and harden. So we were left with just polenta- but that did not stop us from eating it. So this version is slightly different than the original recipe, but I think it’s equally delicious and worth a try! Heat the olive oil in a skillet, then add the mushrooms and shallots. Sauté for about 5 minutes, next add in the garlic and cook for another minute. Then remove from heat, and set aside. In a medium pot, heat 4 cups of water until it is boiling. Lower the heat and add the corn meal, while stirring so no clumps form. Continue to stir the corn meal until it creamy and begins to thicken, about 5 minutes. Then add in the salt, pepper and mozzarella cheese. Continue to cook and stir for another 10 minutes, then remove from heat. Add in the mushroom mixture, stir well to combine all of the ingredients. In the olive oil and bacon grease, heat the onions, mushrooms and jalapeño for about 5 minutes. Once cooked, remove from heat and toss in the chopped bacon. 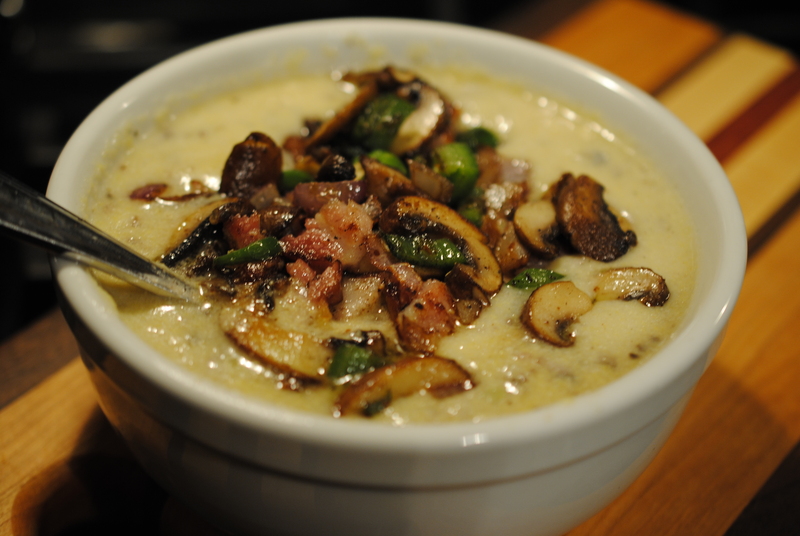 Pour the cooked polenta (corn meal) into a bowl, top with the mushroom topping, and serve. Yes, it’s another post for the Food Matters Project. This weeks recipe was chosen by Dominica of Wine Food Love. She chose Seared Bean Sprouts with Beef and Sesame Orange Sauce, it can be found on page 479 in The Food Matters Cookbook. As with almost every recipe which can be found in this book, Mark Bittman gives some ideas on different variations for this recipe. He suggests tossing the ingredients (bean sprouts, beef, scallions and sesame seeds) with soba noodles, rice or quinoa. From first glance I knew I didn’t want to use beef for this recipe, this past week we’ve had more meat than usual, and I wanted more veggies. When I gave the choice of mushrooms or tofu to Sam, he went with the mushrooms. Then he mentioned he’s not a fan of orange sauce. So I was thinking about soy-based sauces that include sesame seeds, garlic and ginger. Lastly, we’ve a number of noodle dishes in the last weeks for the Food Matters Project, so I decided to not include any noodles and make this a very vegetarian dish. 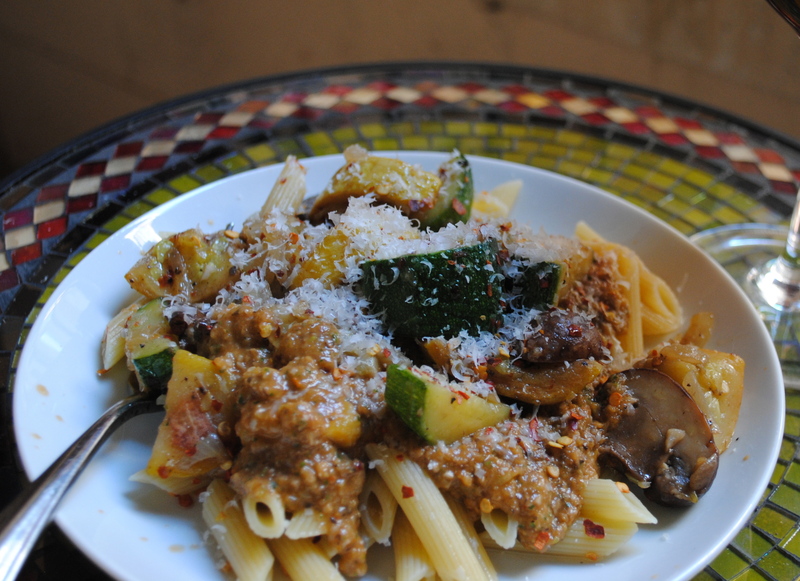 It took me less than 30 minutes to make this, so it’s perfect for a weeknight meal. 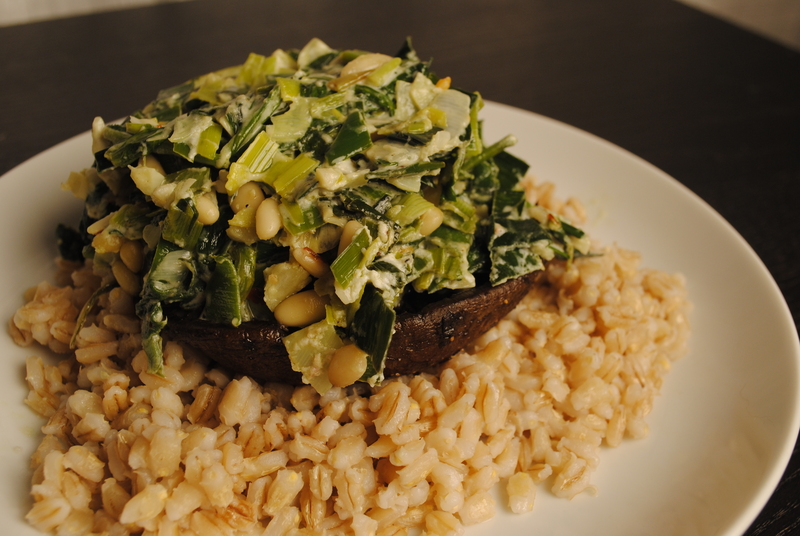 Tofu, chicken, beef or tempeh can be used as a substitute for the mushrooms. If you have a favorite asian sauce, feel free to swap that here. If you’d like more of a crunch, feel free to add some chopped peanuts or cashews. Lastly, different vegetables can be added: broccoli, snap peas, or even edamame are just a start. On a last note, I found that this dish tastes great cold- so no need for reheating. Heat up a skillet, once the bottom is slightly warm, add the sesame seeds. Allow them to toast, while shaking the pan often. Don’t allow them to burn, once they are brown (3-5 minutes) them remove them from the pan and put them aside. Heat up the skillet once again, when it’s warm add the butter and allow it to melt. As it’s melting, add the onion, mushrooms, 4 garlic cloves and 1 tbsp ginger. Allow this mixture to sauté until the onions are translucent and the mushrooms are browned. Once they are cooked, remove the ingredients from the pan and leave them in a separate bowl. Next, add 2 tbsp of sesame oil into the same skillet. Allow the oil to heat up a bit and then toss in the bean sprouts. Sprinkle in salt and pepper. Allow the bean sprouts to sear, and every couple of minutes move them around and flip some over. I continued to cook the bean sprouts until the ends started to brown, and the sprouts had a crunchy texture to them (I tasted them every so often). It took about 10 minutes on medium-high heat. Once they are crisp to your liking, then place them on a napkin, so some of the oil will soak out. In a bowl, or dressing container, mix together: 2 garlic cloves, 1 tbsp toasted sesame seeds, sriracha, rice wine vinegar, soy sauce, hoisin sauce, 2 tbsp ginger, honey and 1 tbsp sesame oil. Shake or whisk together all of the ingredients. Divide the bean sprouts among plates. Then sprinkle the rest of the sesame seeds on top. Next, spread out the mushroom mixture on top of the dish. Then drizzle some of the dressing onto the plate- the amount depends on what you prefer; I think I used about 2-3 tbsp. Lastly, sprinkle the top with the green onions. I know there are many of you out there that do not like mushrooms. I think all of you will change your minds…once you eat this! This appetizer can withstand the test of time, and will always be there in your back pocket when you have last minute visitors. It’s not the trendiest appetizer (like cupcakes are for dessert), but it’s ridiculously easy to make! It provides a great foundation for the other appetizers which you will leave out for your guests. It’s the one appetizer than can be served warm or if it’s a little cooler it will still taste great. It’s easy to prep ahead of time (wait to add the oil right before putting it into the over). Good and simple is what sustains you when you have a million things to cook (or just 3!). I tried out these mushrooms a couple of months ago- and they were a hit. I made them again when we had friends over for dinner this past Saturday. Both times they had disappeared! And all of the thanks goes to Smitten Kitchen. Preheat over to 450°F. 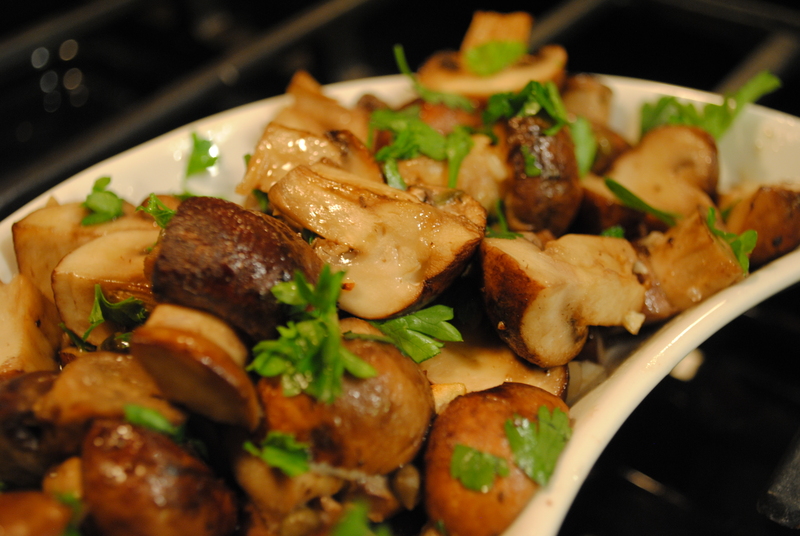 Toss the mushrooms, capers, garlic, olive oil, salt and pepper in a bowl. Pour into a oven-proof dish, or a baking sheet (that has edges). Sprinkle butter on top. Roast for about 15 minutes, until the mushrooms are tender. Once you take them out, toss in the lemon juice and parsley. Set it out with some toothpicks, so it’s easier to eat!